Su Voto Es Su Voz: Everyone Counts is the theme of the 2019 Latino Education and Advocacy Days (LEAD) Week that runs March 25 -30. The series of events and programs brings together those sharing a common interest and commitment to education issues that impact Latinos to help them define the future. 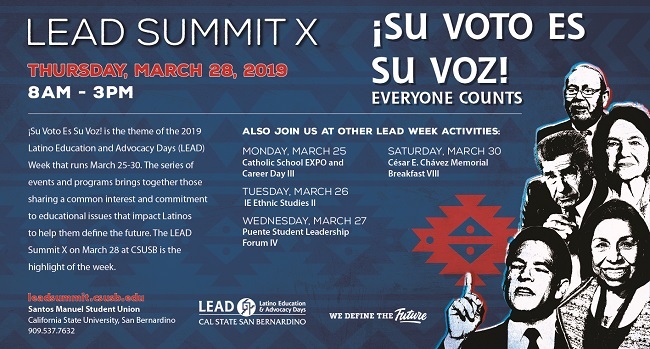 The LEAD Summit X on March 28 at CSUSB is the highlight of the week. Assembly Concurrent Resolution No. 137—Relative to Latino Education and Advocacy Week. ACR 137, Carter. Latino Education and Advocacy Week. This measure would declare the last week of March every year as a statewide week of advocacy for Latino education.